Saturday morning started off with the previously-mentioned surreal experience of eating breakfast a few feet away from the Cigarette Smoking Man. I kept looking over my shoulder to make sure he wasn’t really in character. The first lecture we attended was on Cosmology: A Universe from Nothing by Lawrence Krauss. What a great speaker. Ramona and I both want to go back and read some of his books now. He covered many subjects (including a cool explanation of how we know the universe is expanding), but the one that I found most memorable (and that was tied to a theme in Dan Dennett’s presentation later) was about how the expanding nature of the universe will one day lead to a world in which the scientists will no longer be able to observe the rest of the universe….because it will be too far away. At that point in time, falsifiable, scientifically accurate observations will no longer support the theory of an expanding universe. I have no idea what motivated Krauss to include this thought experiment in his lecture, but the attitude behind even thinking of things like that is what makes rational thought and the scientific method great. Next up was Carolyn Porco. After a brief comparison of science and religion in terms of ways of knowing, she talked a lot about using stories (movies, shows, novels….) to communicate the advantages of science. All of this was done with no visuals. Then she switched gears and used images from the Cassini Mission (she is the leader of the imaging team) to describe the amazing discoveries around Saturn. Listening to her and looking at those images was incredibly moving. All the images from Cassini are available at www.ciclops.org. Martin Pera gave a presentation on Embryonic Stem Cell Research. He reviewed the short history of stem cell research, covered current scientific and political issues, and emphasized the need for flexible legislation instead of restrictive legislation given the early stage of the science (first embryonic stem cell was discovered in 1998). He closed his lecture with a survey of emerging areas in stem cell research. 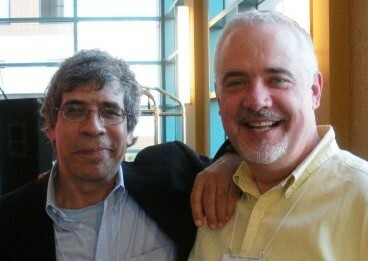 Jerry Coyne, author of Why Evolution Is True, gave a great presentation on……why evolution is true. He was introduced by Richard Dawkins as the scientist to whom Dawkins now turns for expert information on evolutionary biology. As I told Professor Coyne when I met him later (although this probably didn’t mean as much to him as Dawkins’ comment), his blog posts at WEIT are the ones I always read, no matter how many others get culled out when the RSS reader is full. 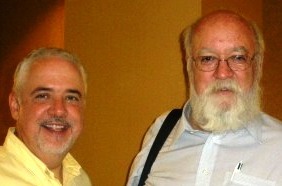 Coyne’s presentation covered the five components of the theory of evolution, predictions which could be made if the components were true, scientific evidence from various fields of study which supported the predictions, and for kicks, what would need to be discovered to disprove evolution. He closed with a discussion of the apparent correlation between success and lack of belief in a god at the country level, summarizing that we need to make the world a better place so people won’t need a Sky Father. I’ve been juggling several of Dennett’s books/writings on consciousness over the last few months, and was happy to have a chance to ask him about the order in which a layman should read them. I caught him in the hallway after he’d come out of an interview with a journalist, so I imagine he was happy to field a fanboy question. He suggested I read Elbow Room to understand the place-holders he was building for his future writings, Consciousness Explained to see the full picture of his thinking on the multiple-draft theory (and he warned me that this book was written for laymen but contained pointed arguments targeted at professionals), Darwin’s Dangerous Idea to see his take on the power of evolution and then Freedom Evolves for the synthesis of evolution and consciousness thoughts. Now I know, read them in the order he wrote them. The final speaker on Saturday was Richard Dawkins, who started off his presentation by admitting that he was on a book tour, then read to us from the last chapter of The Greatest Show on Earth: The Evidence for Evolution , with editorial comments. Sounds like a very interesting book.